A landed proprietor and long-standing member of the "Cowgate" merchant community of Dundee with a number of interests in railway companies across the world. 13 King Street, Dundee, c.1842-1845. Wellbank House, Newport, Fife, c.1846-1850. Graybank, Nethergate/Perth Road, Dundee, c.1853-1857. Westbank, Roseangle/26 Magdalen Yard Road, Dundee, c.1858-1865. Member, interim provisional committee, Dundee & Forfar Junction Railway, 1845. Vice-president and representative member, Dundee Curling Club, c.1850-1854. Member of Local Marine Board appointed by the Board of Trade, c.1853-1869. Local director, Colonial Life Assurance Co., c.1856-1862. President, Hawkhill Bowling Club, c.1856-1857. Committee of management member for the county of Fife, Tay Ferries, 1856-1869. Shipowner member of committee of subscribers for the improvement of the pilotage of the River Tay and harbour of Dundee, c.1858-1859. Local director, Northern Assurance Co. united with the Forfarshire and Perthshire Insurance Co., c.1861-1868. Ordinary director, Dundee Banking Company, 1861-1862. Member, Royal & Ancient Golf Club, St. Andrews, 1862-1869. Chairman, Dundee Sea Insurance Co., c.1864-1865. Captain, 1st Forfarshire (Dundee) Rifle Volunteers, c.1864-1865. One of the patrons, Grand Musical Festival, Theatre Royal, Dundee, 1865. 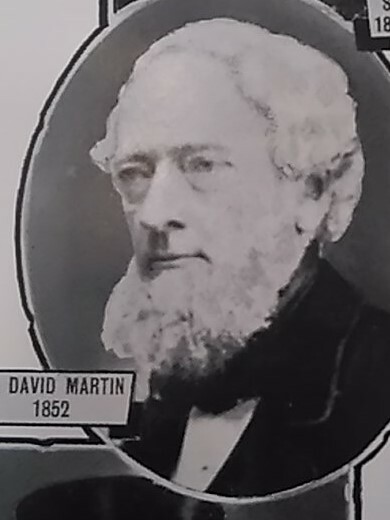 Life member, Scottish Meteorological Society, 1865-1869. Subscriber to Fifeshire Cattle Plague Association, 1867. Director, Dundee & Newtyle Railway Co., c.1868-1869. Lindores Curling Club, c.1868-1869. Shareholder, Snuff and Twopenny Club, Dundee. Debenture holder, Eastern Club, Dundee. Shareholder, Dundee Corn Exchange and Public Hall Association. Commissioner of Supply, County of Fife, c.1838-1869. Subscriber no.19 – George Burnett – fellow Board of Trade appointee to Local Marine Board. Subscriber no.65 – Peter Duncan – fellow director of Northern Assurance Co. and executor of Pitcairn’s will. St. Andrew Street, Dundee, c.1834-1837. 10 Bain's Square, Dundee, c.1842-1869. David Pitcairn of Kinnaird was the son of John Pitcairn of Kinnaird and Jean Martin, daughter of the Rev. Samuel Martin of Monimail, and was born in Monimail, Fife in 1810. He was the eldest son. He served an apprenticeship with George Newall, a Dundee merchant, but was appearing in the local directories as a merchant in his own right by 1834 in partnership with William Ritchie at 11 Cowgate. Shortly thereafter he was taken into partnership by David Martin, merchant, along with David Martin junior. These two new partners were both nephews of the senior partner. 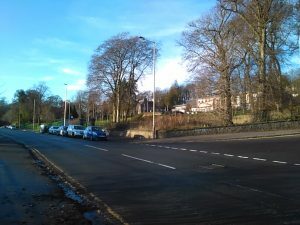 The firm was considered "one of the largest businesses in Dundee for a great many years." David married Sophia Duddingston Russell, Auchtermuchty, in 1843, but she died the following year, aged only eighteen. She is commemorated on the Pitcairn family monument in Abdie Churchyard. As the oldest son of a landed proprietor he appeared in records as David Pitcairn younger of Kinnaird. His mother died in 1847. He married Anna Maria Bell, daughter of the late Alexander Bell, a Dundee surgeon and fellow of the Royal College of Surgeons of London, in 1853. The couple do not appear to have had any children. 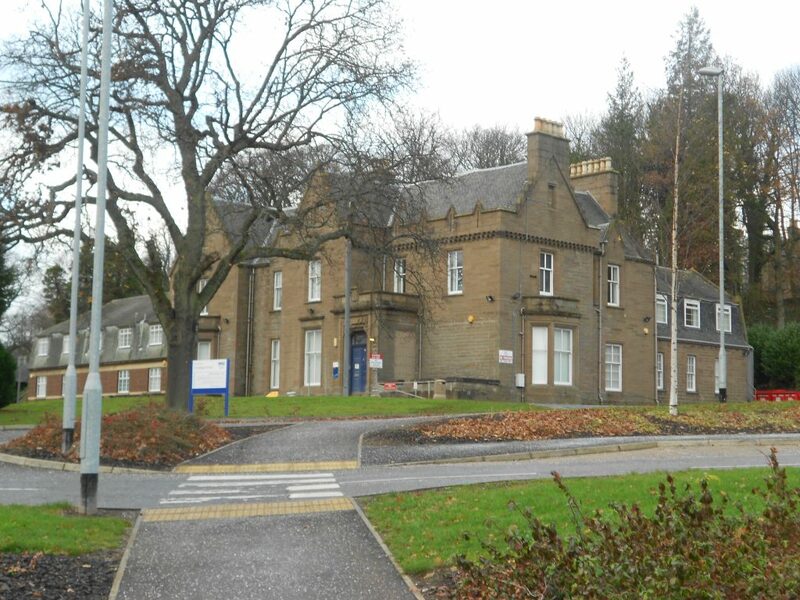 Mrs Pitcairn involved herself in philanthropic activities, including being a lady governess of the Dundee Royal Orphan Institution and a member of the ladies committee of the Dundee Industrial Schools Society. David succeeded his father in the Kinnaird lands in 1857, but he remained principally a flax and linen merchant in Dundee. His younger brother, John, was his tenant in the lands of Kinnaird. David also owned a tenement in Cupar. 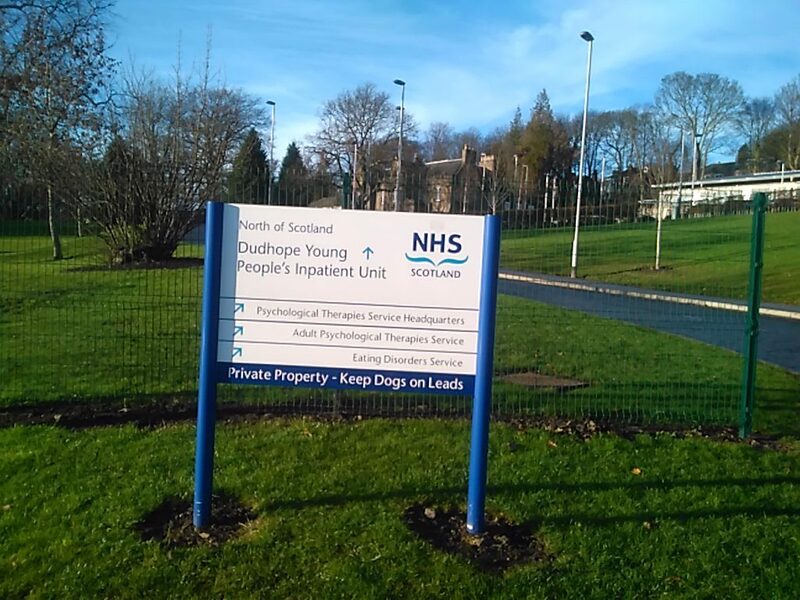 In 1866 it was reported that David Pitcairn had leased Dudhope House for a term of years. This large house in Dudhope Terrace, Dundee was rebuilt for Richard Gardner in 1850 to designs by Charles Wilson. 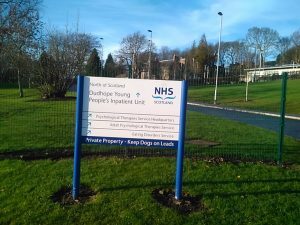 The Category B listed building is now much added to and in use by the NHS as a young people’s unit. He left a considerable personal estate of £32,255 13s. In accordance with the wishes stated in his late father’s will, David directed that his brother, Hope Pitcairn, should not inherit “any of my effects.” His other brother, John, who was one of the two executors, was the main beneficiary, with responsibility for legacies to his sisters and Hope’s children amounting to £10,000 and an annuity of £500 to David’s widow. John was already the tenant of Kinnaird. Among David’s assets were stocks in a number of railway companies in Scotland, England, USA and Canada. He also had interests in coffee, tea, insurance and silver mining companies. There were also two Dundee ships, the Arica and the Adriatic, in which his company held shares. As David’s immediately younger brother, Hope was adjudged to have inherited the lands and barony of Kinnaird and succeeded in defending his position in the Court of Session against his brother, John, when Lord Mure judged that the will did not affect his succession. David did not specifically mention the land in his holograph will and it was ruled that there was enough money to cover the legacies from his personal estate. Interestingly, his ten £10 shares in the Albert Institute Co. were valued at five shillings a share in 1869. With David’s death the firm of David Martin & Co. was wound up. Its founder had appeared in the directory as early as 1809. David’s widow moved to Fort William House in Broughty Ferry shortly after his death, where she died in 1894. Old Parish Records. Monimail, Fife. Birth. 15 December 1810. Ancestry website and Baptism. 3 January 1811. 448/20 110. ScotlandsPeople website. 1861 Census Scotland. Dundee. 282/2 ED13 p.8. ScotlandsPeople website. Old Parish Records. Auchtermuchty. Banns. 30 June 1843. 406/30 130 and Dundee. Banns. 5 July 1843. 282/230 90. ScotlandsPeople website. Old Parish Records. Dundee. Marriage. 1 June 1853. 282/230 449. ScotlandsPeople website. Dundee Directories, 1842-1845. Local Studies, Central Library, Dundee. Dundee Directories, 1846-1850. Local Studies, Central Library, Dundee. Dundee Directories, 1853-1857. Local Studies, Central Library, Dundee. Dundee Directories, 1867-1870. Local Studies, Central Library, Dundee. Statutory Registers. St. Andrew, Dundee. Death. 2 February 1869. 282/4 126 and Register of Corrected Entries. 17 March 1870. 282/4 1 29. ScotlandsPeople website. Transcription of Monument, Abdie Churchyard, Fife. Sacred to the memory of David Pitcairn of Kinnaird and Anna Maria Bell, his wife. DeceasedOnline website. Scotsman, 25 October 1845. British Newspaper Archive website. Dundee Directories, 1856-1862. Local Studies, Central Library, Dundee. Dundee Directories, 1861-1868. Local Studies, Central Library, Dundee. Edinburgh Evening Courant, 2 October 1862. British Newspaper Archive website. Dundee Directory, 1864-65. Local Studies, Central Library, Dundee. Dundee People's Journal, 23 September 1865. British Newspaper Archive website. Dundee Advertiser, 18 April 1865. British Newspaper Archive website. Fife Herald, 14 February 1867. British Newspaper Archive website. Northern Warder, 28 May 1869. British Newspaper Archive website. Fife Herald, 11 February 1869. British Newspaper Archive website. Testamentary Records. Dundee Sheriff Court. 13 April 1869. SC45/31/22. ScotlandsPeople website. Dunfermline Register, 1838. List of Commissioners of Supply. David Pitcairn younger of Wester Kinnaird. Ancestry website. Dundee Directories, 1844-1865. Local Studies, Central Library, Dundee and Dundee Advertiser, 23 December 1863. British Newspaper Archive website. Dundee Courier, 4 February 1869. British Newspaper Archive website. Dundee Directories, 1842-1868. Local Studies, Central Library, Dundee. Dundee Directory, 1834. Local Studies, Central Library, Dundee. Dundee Directories, 1834-1838. Local Studies, Central Library, Dundee. Dundee Directories, 1842-1869. Local Studies, Central Library, Dundee. Old Parish Records. Monimail, Fife. Birth. 3 January 1811. 448/20 110. ScotlandsPeople website. Photograph and transcription of monument, Abdie Churchyard, Fife. Sophia Duddingstone Russell, wife of David Pitcairn, Dundee, died 21 March 1844 aged 18 years. Ancestry website. Photograph and transcription of monument, Abdie Churchyard, Fife. Jane Martin, wife of John Pitcairn of Kinnaird died 14 September 1847 aged 67 years. Ancestry website. Dundee Courier, 8 June 1853. British Newspaper Archive website. Dundee Directories, 1856-1870. Local Studies, Central Library, Dundee. Dundee Directories, 1864-1870. Local Studies, Central Library, Dundee. Photograph and transcription of monument, Abdie Churchyard, Fife. John Pitcairn of Kinnaird died 7 June 1857 aged 88 and Voters Lists, 1857-1864. Abdie Parish, Fife. Ancestry website. Voters Lists, 1857-1864. Abdie Parish, Fife. Ancestry website. Dundee Advertiser, 20 October 1866. British Newspaper Archive website. McKean, Charles and Walker, David. (1985) Dundee - an illustrated introduction. Edinburgh: Royal Incorporation of Architects in Scotland and Scottish Academic Press. 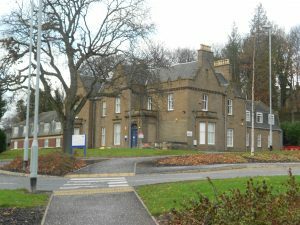 Dudhope House. Category B Listed Building. LB25276. British Listed Buildings website. Glasgow Herald, 26 November 1869 and Fife Herald, 3 March 1870. British Newspaper Archive website. Dundee Directory, 1809. Local Studies, Central Library, Dundee. Dundee Directory, 1871-72. Local Studies, Central Library, Dundee. St. Andrews Citizen, 10 November 1894. British Newspaper Archive website. Thanks to the ever-helpful staff of Dundee Central Library's Local Studies and of Local & Family History, A K Bell Library, Perth and Perth & Kinross Archives. The information above about David Pitcairn has been collated from a range of digital and hard copy sources. To the best of our knowledge it is correct but if you are relying on any information from our website for the purpose of your own research we would advise you to follow up the sources to your own satisfaction. If you are aware of an inaccuracy in our text please do not hesitate to notify us through our Contact page.